HTC Ville is in news and rumors from many days. Different mobile phobe blogs updated us about this handset. It might possible that you didn’t check its detail before so for your information it is the thinnest smartphone to the date. It is running on latest Android 4.0 Ice Cream Sandwich operating system. I also watched a leaked video of it. It will come with HTC Sense 4.0 User interface. There is an 8MP rear camera which allows you to capture high quality pictures. It will also feature a VGA front facing snapper; however resolution of this snapper is not leaked as yet. It is powered by a dual core 1.5GHz processor and features with a 4.3 inch qHD display. 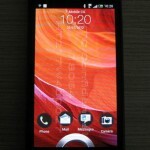 According to recent report, HTC will launch the smartphone at MWC 2012. We will soon get some more information related to HTC Ville. So stay tune to know more.